Expected: The CEO of Facebook, Mark Zuckerberg, was summoned by the United States House and Senate for back-to-back hearings. The Congressional hearings were ordered in response to revelations surrounding the platforms to 3rdparty data-sharing agreements. The hearings proved two things. 1) Mr. Zuckerberg is not a robot as previously believed by pundits. 2) Countless elected officials are not as technologically-literate as their constituents would like to believe. Ironic: Apple is notorious for taking information security very seriously. The company takes leaks so seriously, that a recently leaked memo says they discovered 29 leakers last year and had 12 of them arrested. Will the person behind the latest leak find themselves on next year’s memo about data leaks? Will that memo also be leaked at some point? Who knows! Surprising: Disney introduced ESPN+ this past Thursday. To the surprise of many, it turns out the House of Mouse has had an 80% controlling stake in ESPN since 2014. ESPN + is an all-in-one premium streaming service that offers thousands of live streamed events as well original films and more. Oh, and of course the vast ESPN on-demand library, in case viewers want to watch actual sporting events for some weird reason. Now that we covered those ever so interesting developments, let’s focus on what really matters – the $1.6 million-dollar question. What’s going on at Datacrushers? Have you seen our brand-new Email Marketing Automation Suite add-on? No? Ok, let’s get you up to speed on what this game-changing add-on will do for your business! The brand-new Datacrushers Drag and Drop email editor in action! Drag and Drop: Featuring a simplified, streamlined interface. This new email template creation tool will help you step up your email marketing campaigns like no other. You can get started with the new Drag and Drop email editor in seconds! Oh, and it is available to use across the entire DataCrushers email stack! eCommerce Newsletters: Featuring cutting-edge smart filters for pinpoint, precision shopper retargeting, eCommerce Newsletters will take your sales game to the next level! They are also great for keeping shoppers up to date on the latest developments. The brand-new email creation environment for eCommerce Newsletters! Welcome Series Emails: Welcome new subscribers to your email blasts the right way! With a Welcome Series email, your new subscribers will only have reasons to come back and keep shopping on your site. Want to learn more about these incredible new features? Click here! Fintech has a ton to offer the world of eCommerce. It can help eCommerce merchants reduce cart abandonment and boost site-wide sales. In this article, we look at the best Fintech-based, consumer-loan financing partners for your business. What does the future hold in store for eCommerce retailers? If you answered VR, AR, and 5G – that is correct! In this awesome little piece, we detail exactly how these up and coming technologies are going to change the world of eCommerce marketing and sales in a major way! The Recently Uncovered Connection Between Cart Abandonment and Passover! Did you know that Passover and cart abandonment have something special in common? A highly skilled team of historians and anthropologist at Datacrushers recently uncovered this startling connection between the modern world of eCommerce and the Passover story. LinkedIn: The social media platform for pros! Facebook: Because Google + isn’t really a thing anyway! And of course, right here on the Datacrushers blog! Thank you for reading up on the latest! Keep crushing it, and feel free to hit the banner below to schedule your FREE 14-day pilot with Datacrushers! 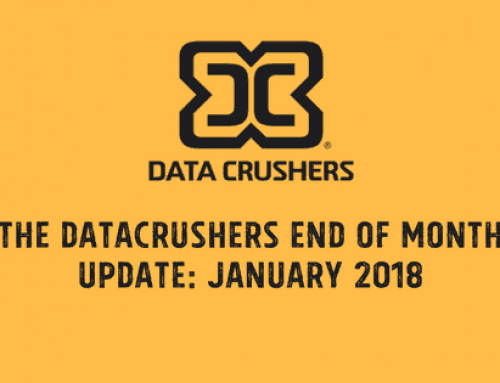 This Week at Datacrushers: March 2018 Mid-Month Update!